Callaway is a major player in the golf industry. They are consistently at the top and usually leading when it comes to the newest and greatest technology. Plus, they've got Phil Mickelson, the #2 golfer in the world, as their poster boy. I've never been a big fan of their irons. I believe for years Callaway was focusing their attention on the higher handicappers looking for a big club head and a lot of forgiveness. I don't like the hefty, ping-pong paddle look of their oversized irons. However, this is not the case with these FT irons. These clubs are designed for better players. 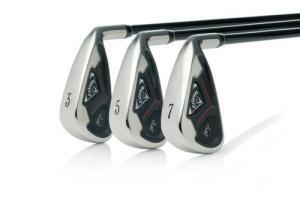 They've got more "tour" characteristics with the smaller face and thinner top line. The clubs have a "Tunite Cradle" that allows for 80% of the clubs total weight to be placed in the extreme perimeter giving it a high MOI. The titanium face will make the ball jump off of the face, and the "TPU Sensert" decreases vibration and increases feel. The only con I can see in these beautifully designed clubs is: it's not going to be as workable for you scratch golfers looking for super high performance sticks. In other words, you won't see these clubs in Lefty's bag. That being said, I really like these irons. Callaway has packed all the forgiveness and play of their big-faced clubs in a sleek, hot-looking club.